This sundae, although not exactly the same, reminded me of what I used to order, only healthier. Hope you enjoy it as much as my family did! Add teaspoon of chocolate syrup to marshmallow fluff. Microwave for a few seconds and stir, blending well. Add a little spoonful to the bottom of a skinny glass (such as a champagne flute). Add a few berries and then a small dollop of cool whip. Repeat with marshmallow fluff mixture, berries and then cool whip. 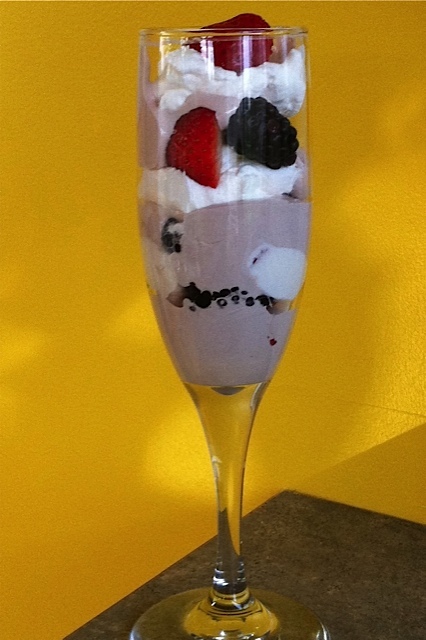 Add a berry or two on top and wa-la, a wonderful light and refreshing dessert for less than 2 points. If you'd like a printer-friendly recipe for this recipe, Click Here.